My last official day of summer is here. My thoughts about this fact are as varied as the weather in Texas during the past year. This summer is the hottest one I can remember experiencing in my entire life. There have been weeks of temperatures over 100 degrees, very little rain, and relentless dust blowing across our land. I frequently envision western movies being filmed on our land when I am walking our trails with the dogs. The air is still. The grass is withering. The locusts are locusting. The ravine is dried up. The snakes are slithering. Obviously, there have been some negative aspects to the heat and dryness of our farm. The heat took a toll on my otherwise healthy chickens. Four died in a very short time period on the day it reached 109 degrees on our farm. Everyone, both people and animals, suffered through a couple of record-breaking days of heat in Texas. Our multiple window A/C units tried relentlessly, but failed to keep the house cooled. Even our tap water ran warm for days. Hopefully, we will never experience this type of heat again on Green Acres. During the weeks of heat, The Outdoorsman and I took our cues from the animals and stayed indoors for most of the day. On those days, you couldn’t find one of our animals standing in the open pastures. They were tucked into houses, pens, corrals, decks, and porches from morning to night each day. They all came to life at around 8:00 p.m. each day for feeding and watering. Because we mimicked the animals, The Outdoorsman and I spent more than our normal share of time indoors this summer. Watching movies, taking naps, and reading became the norm for us during those weeks. The good things that came out of the heat was that it forced us to slow down and be careful what we were doing on the farm. We tend to push ourselves a bit too much at times, but we were practically forced to stay indoors when temperatures soared above 100 degrees. It was good for us to take some time to relax. A completely unexpected summer blessing came in the form of a women’s Bible study that literally appeared out of nowhere like a mirage. What began as a texting conversation with a new friend in our little town quickly formed into a full-fledged book study with four other women in which I, somehow, became the mentor to four other moms of young children. This was not something I was planning or even thinking about doing, but it was obviously part of God’s plan. Over the past six weeks, we have met weekly to talk about the book, encourage and pray for one another, and laugh about life with our husbands, children, animals, and farms. The amazing thing is that we are all so similar in many unexpected ways even though we all hail from different towns and a variety of religious backgrounds. It has been humbling to see what God can do with people when their hearts are open to new friends. These women whom I didn’t even know when summer began are now my go-to-gals for encouragement, prayer, and support. They have been such an unexpected gift to my heart. In addition to these sweet local friends, The Outdoorsman and I have felt much more a part of our farming community. We have experienced the generosity and friendliness of the locals on many occasions this summer. 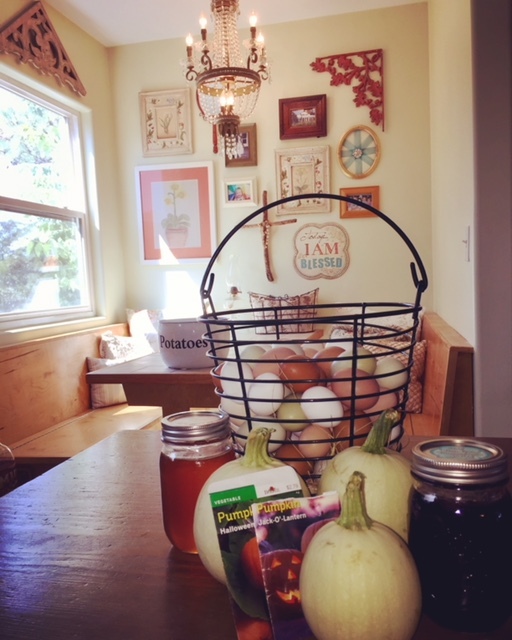 Whether it was through the selling of our new piglets, the shearing of our sheep by some really sweet neighbors and new friends, the trading of produce, jelly, and honey, or a conversation about animals, we have met some amazing and helpful people whom we are blessed to call fellow townspeople. Summer, you have been amazingly good to me. You gave me abundant peace and tranquility, amazing new friends, precious time with old friends, ample time with our three children, a beautiful new daughter-in-law, and much-needed rest. Even though the heat has been hard on the animals and vegetation on Green Acres, the stillness of the summer has been good for my soul. Thank you, Summer, for the way you refreshed my heart. i loved the story and it was amazing and i agree it was really hot.